ETECT is a family story. Felix and Eric Schiano, father and son, who set up a business in 1990. Two men, two skills, textile and composite materials. 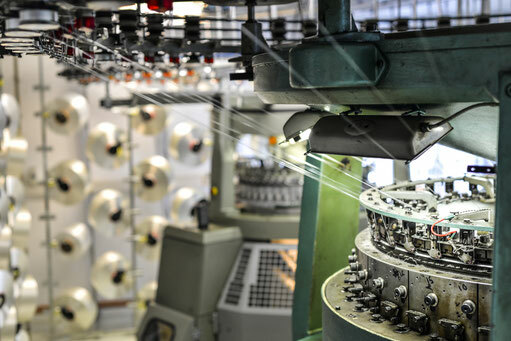 This association has enabled the development of textile products with the combination of yarns used for composite materials at a time when textiles for technical use were in their infancy. Inflammable textiles and flame retardants were the first technical textiles manufactured by Etect, and aerospace the company's first client with prestigious clients such as: Air France, Aerospatiale, SOGERMA, SEP (Ariane) , the French Atomic Energy Commissariat (CEA), the French Army and many others ... In other words, it means seriousness, innovation, and quality. During its first 10 years, Etect has constantly developed new products to meet ever more technical demands, thus constituting a true know-how and an extremely complete technical library. Trachea in biomaterials to the first 3D. In 1994 Etect developed the very first knitted fabrics with 3D architecture in collaboration with the French Atomic Energy Commission (CEA). These multiple searches have been the subject of an international patent that is at the origin of many innovations today around the world. Faced with the strong industrialization of the aerospace industry and having to cope with the sharp drop in the price of transport, we changed direction in the early 2000s to develop know-how for composite materials of the future, including materials bases. carbon / carbon for the aerospace group SNECMA, leaving for some time the development of new technical textiles. Then Felix Schiano left the company to live a deserved retirement, and Eric Schiano refocused the company on its core business, technical textiles. In this new phase, Etect has developed a highly penetration-resistant textile for high-level fencing sport. It took 6 years of work to reach the required level of requirement with an optimal price / performance ratio. Today Etect is leader in its market and achieves 95% of its turnover in export. The next step is already started with the creation of Designs products for luggage that we realize in our workshops from our textiles and that you can discover very soon under the brand Woov. Have a nice day and have a good visit.